Hello. I just finished my first full map for my game and am really excited to share it and get some feedback! As you'll see, I used Celianna's Futuristic Tile Tiles Resource Pack (DLC off Steam) as the base tileset. I highly recommend it, as it provides a lot of variety in one tileset. The map was meant to feel large while still limiting the amount of redundancy in decorations. Near the end, I started to notice a little lag, so I had to delete a couple of unnecessary decorative events. I'm hoping that the addition of my NPC events won't gum up the map too much. I also wanted the map to feel like it made logical sense from a practical engineering standpoint (for example, the main water treatment room is adjacent to the showers, garden, and kitchen; the medic bay is down the hall from the gym). The centerpiece of the map is a giant VR training sim (think X-Men's danger room) that plays a central role in the story, with the first chapter taking place in it. I'm not entirely satisfied with the shading. I ended up trying to follow the default shading rules (entire map shaded from a light source to the left) because I liked the visual effect shading had in a couple of places, but I wanted to be consistent. I toyed around with the idea of removing shading entirely, since this was an interior map afterall. I also considered doing custom shading for each room, assuming each room would be lit by a central lighting source, or doing something else, but I didn't feel comfortable enough doing this. 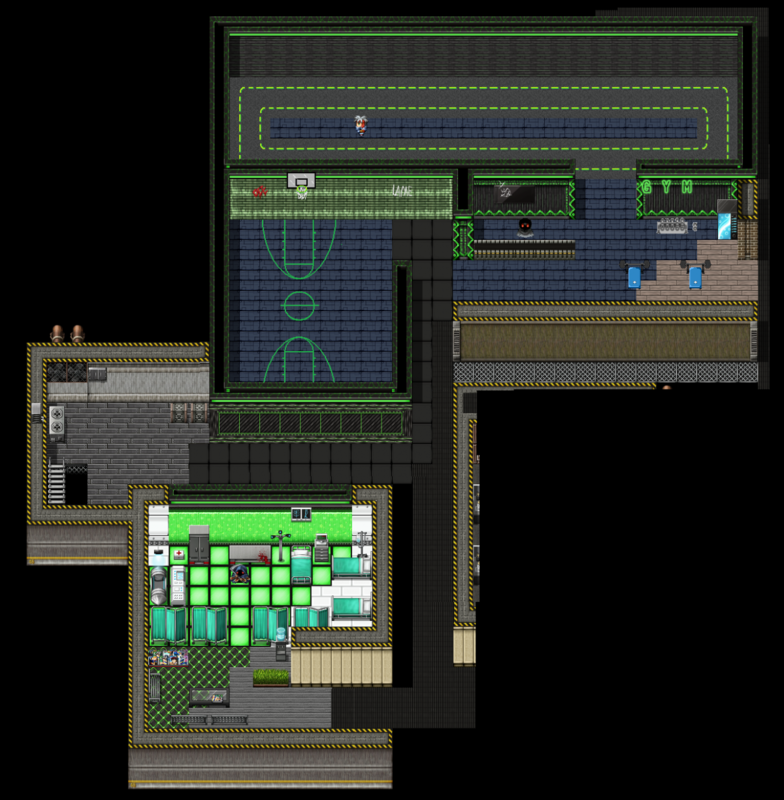 I used a couple of character graphics for my map that other people made- Hira's arcade machines, Avadan's mech, Rico's bathroom signs, and r0knes's weight bench and dumbells (pending permission to use them, of course). I also added the large trees and a couple bushes from the Modern resource pack. My own original creations include the punching bag, dart board, chess game, basketball court, and modified tiles to make the track circular. I plan on making and importing a paralax background for this map that's mostly a twisting mess of pipes, gears, and steam valves. This should be visible in the gaps throughout the map. This next screenshot is from the left side of the ship. In a later chapter, the ship sustains damage which results in the VR generated world to "bleed out" of the bay and into the ship itself, and the party must navigate through the ship and shut off the VR core (click this link for more information on the proposed story: http://www.rpgmakervxace.net/topic/21915-plot-outline-for-a-sci-fimodern-rpg-using-a-plot-twist/ ). I saved the greenish tiles from the tile pack to use in this map and hope that it has a nice alternate/perverted reality feel. I think you did a nice job! The map is far larger than I'd ever attempt, but it looks like there's lots to explore and see. The lag issue is, of course, understandable. But I do like the thought you put into utilities such as the water distribution. I would maybe swap out the median on that indoor running track for plants or the potted grass to give it a less industrial aesthetic. For your shooting range, I think there are target dummies out there somewhere, but I haven't the faintest what they look like. However, since you've created a few things yourself, maybe just design your own? I just feel like something visible needs to be in the range itself to really cement it's purpose. The old mattresses that you're using as tables seem out of place. I'm working with the same tileset, and I'm using them for urban blight decoration, so that could just be me not seeing them the same way as you are, but I think old mattresses were their graphic intention. The hydroponics gardens are a terrific touch, but I never liked the way you can't blend the dirt tile with the floor tiles in the Futuristic set. It's just a sort of abrupt transition. I would handle it by using a surround water tile, then surround those with your floor drains. However, that might make it bulky in the space you have available. I would say think about a lighting script, but they tend to add lag. You can do some neat effects with them, though. I'm learning to use Victor's Lighting Script right now, and if you can pull it off, you could make some of the more utility areas slightly darker or something. It might also help to reduce lag by dividing the map up into smaller maps and connecting them via continuous hallways as opposed to doors so you don't break the feeling of the ship being a whole. I'm a bit jealous of your basketball court, haha. I'd love to have that and maybe a baseball diamond for one of my cities, just to give it more of that "people actually live here" feel. Nice work all around, though! Thank you for your thoughtful input! I agree a shooting target would be nice for the range. I know I've "reinterpreted" several of the tiles; I think my biggest offenders are the big white circular carpets, which I didn't know if I could fool people into thinking were tables or not. 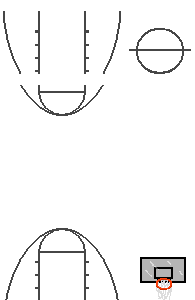 By the way, here's the sheet I used for the basketball court, free to use in anyone's personal or comercial project. You might need to tweak it a bit for your own preferences. It's a 3 x 4 (horizontal by vertical) character sheet, designed to be placed as events in a very specific way to fit a court of that perspective. I set the grey color of the basketball backboad as the translucent color. The center circle might need to be adjusted since I don't feel it's entirely centered. I think the line color and floor tile can be tweaked to good effect, say, if you want it to be more of a "street" court. You're only supposed to post a new thread in the Screenshots if you have 3 or more maps. Either you can take two more close-ups or you can post this in the Screenshot Critique thread instead I'll lock this if you want the Screenshot Critique thread. Okay, I'll add a couple more screenshots.